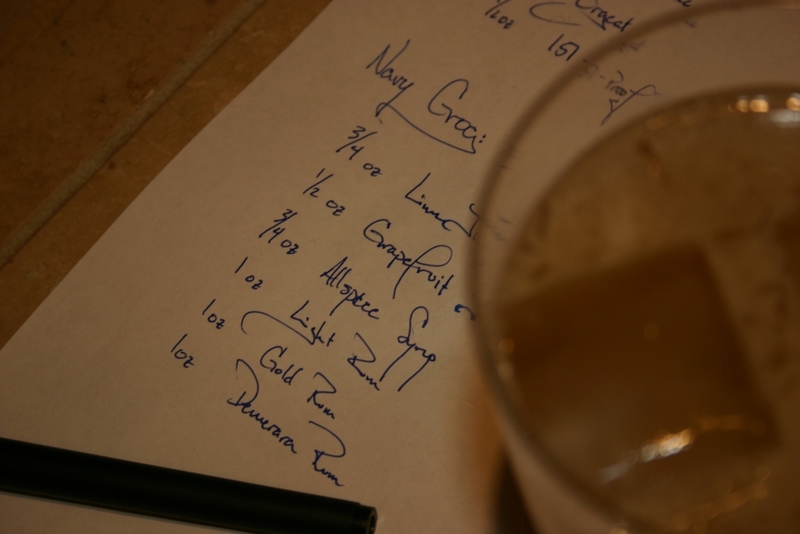 So, I’m a relatively simple guy with relatively simple tastes, and it should be known that if a cocktail’s name includes the word Grog you can count me in. Gets me back to my pirate roots, you know. So, when I ran across a reference to Navy Grog while researching Tiki cocktails I knew I had to make one. One of the ingredients also piqued my interest, Allspice Syrup. Allspice syrup is nothing more than simple syrup that has been infused with Allspice. There was a simple recipe given on the Tiki Central Forums. I used this as my base and went from there. I used an entire container of allspice that I got from the local Safeway, on sale no less. Rather than grinding the allspice in a spice grinder I chose to crack them in a mortar and pestle. My thinking being that this would make it much easier to filter out the solids after infusing. I combined one cup of white sugar with one cup of water and the cracked allspice berries. Simmered the lot, stirring occasionally for 2 minutes to dissolve the sugar. Then turned off the heat, covered the pot and let it sit for two hours. By now the wonderful smell of allspice had filled my apartment and I was loving it. Now came the part I had been slightly dreading, filtering. In the past I haven’t had much luck with the coffee filter method as it takes way too long to filter. A strainer is much faster but tends to leave some of the smallers bits in the solution, not a great option. In one of my lesser use cupboards I found a French press coffee pot, which turned out to be a perfect answer. I poured the syrup and spice bits into the pot and slowly depressed the plunger. Since my grind wasn’t terribly fine the filter was able to remove all the solids leaving a nice brown flavored syrup. I added my usual one ounce of everclear to increase the syrup’s longevity and I was ready for cocktail making. The recipe I used was also from the Tiki Central discussion referenced above and is credited to Jeff “Beachbum” Berry’s Grog Blog. three ounces. This was the poster's recommendation. This cocktail has a great flavor. The allspice comes through but not overly strongly, which I think is key. Allspice could easily overload the other flavors in this cocktail. 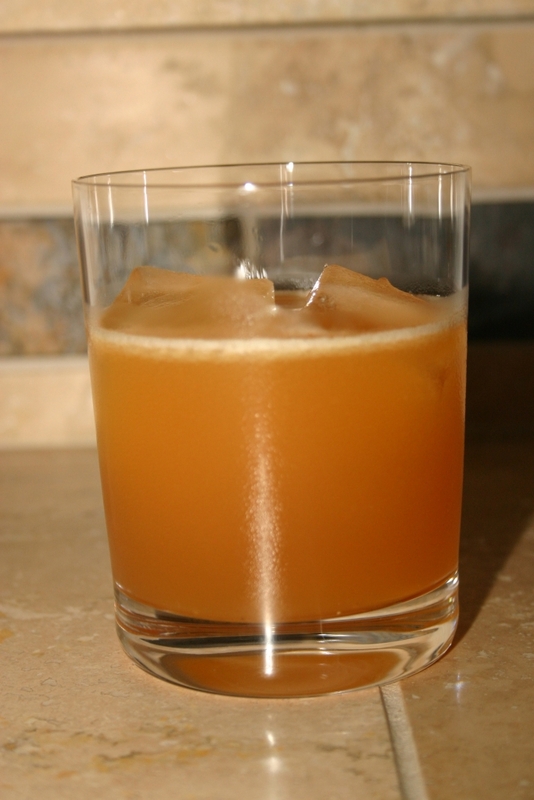 It also presents a nice fruity flavor and the rum flavors shine through. I tried two different mixes of rum. One pretty standard with Bacardi Light Rum, 10 Cane, and Gosling’s Gold Seal. The other a more top shelf blend with Rhum Barbancourt White Rum, Rhum Barbancourt 7 year, and Flor De Cana 7 year. Both were very good and truthfully I don’t think you gain much by using the top shelf rums in this drink. The other flavors are strong, so they overwhelm the subtleties of the more expensive products. One thing I do really like about the Barbancourt Rhums is they add a nice grassy note to the cocktail. This was a great cocktail and made me feel like a true pirate. Although, next time I think I need a more Tiki inclined drinking vessel. Looks like it’s time for some eBay searching. Enjoy your Grog matey!